After watching the epic Baki Episode 18, it has become clear that the next episode is going to be amazing. In the last episode, we saw how Retsu Kaioh smash Hector until we saw someone stabbing him from the back. After he comes to consciousness he sees Hector standing in front of him protecting him. It was also unexpected to see Retsu running on water even after taking Hector on his back. By the end of the chapter, we see Hector blasting the “Shinkai Karate Dojo”. In the next episode, we will see Hector facing the new opponent. 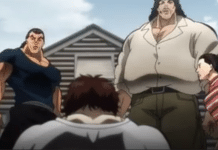 Now for those who don’t like spoilers, then this is a warking that in below you will read a spoiler about Baki 2018 Episode 19. Talking about the new character, he looks similar to Doppo, but his character is yet to be defined. We will see some conversation sharing between Hector and the new guy. Looking at the spoiler it seems that, he is one of the Karate guy, who is not happy with what Hector has done with the Dojo. We will see how Hector gets knocked out with just one punch & when he wakes up he is there in the same Dojo facing another opponent who is waiting for him to wake up. The one who is waiting is none another than Katsumi Orochi, whose faces have been burned & is here to defeat him. We will be seeing how he knock him off until he doesn’t say that he accepts the defeat. It seems that hector is going through some bad days. According to the official date, Baki 2018 episode 19 will release on 29th October 2018 & as expected we are going to witness some intent action moments in this episode. Also, you are welcome for an open discussion on this episode in the comment below.